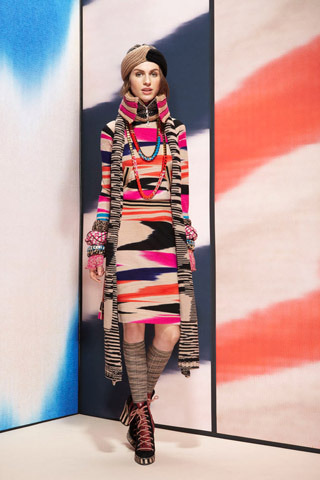 Italian Missoni knits would fill my closet if I were wealthy, or willing to max out my credit cards (and give up my beloved husband.) I love their woven designs (zig zag, space dye), the feel of their fabrics, and their color combinations. I bought a lovely, gently used Missoni sweater at my favorite upscale Goodwill. It’s from their lower end M Missoni line, which is still beyond my librarian’s budget. The drape is so flattering – I had no idea how well made it was until I tried it on. Imagine my excitement when I read that Missoni, is collaborating with Target to create a limited collection – it’ll be available in stores on September 13. I love that the Missoni family is confident enough with their brand that they’ve collaborated with Target. I’m sure people will be lined up outside Target but not me. Having worked at Neiman-Marcus’ clearance store, Last Call, I want no part of grown women physically fighting over a piece of clothing. Really, some people have no dignity. And some of them get violent. Unless a pair of sized 9 narrow Louboutin flats at 75% off is involved, I’m not waiting in line. And…it’s not very likely the Portland area stores will get the whole collection like NYC or Chicago. I tweeted my question about whether PDX stores will get a comprehensive collection and the answer was: “target.com will have the complete collection. 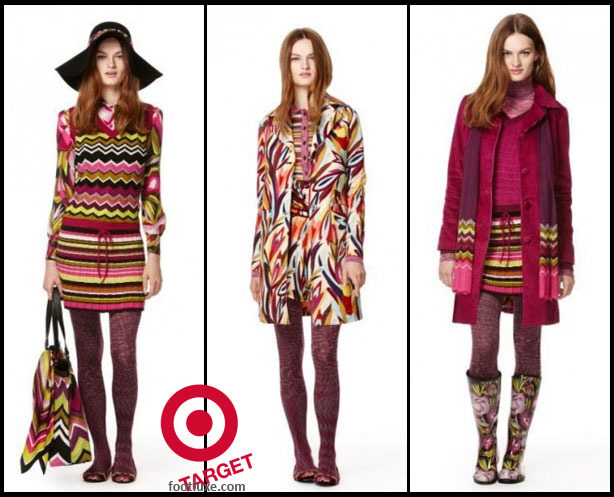 All stores will have #MissoniForTarget items” which implies all stores will have “some” items. The collection includes clothing, housewares, and luggage, and will be very affordable. You know where to find me on September 13… www.target.com. To read about the history of the still family owned company and photos of old collections, their website has lots of information. Target’s Press Release and this Tarte Advertising Inc. article have information about the Missoni for Target collection. I love wintry fabrics like wool, cashmere, and tweed, and live in the perfect climate to wear it for months on end. I’ve always liked tweed, but growing up in South Florida, it wasn’t practical at all. My first winter here, I bought a long tweed A-line skirt that I still love to wear. It’s 10 years old and I imagine it’ll last many more. This may be my lucky year, though. Talbots, which I’ve written about before, has come a long way in the past year. I’d long considered Talbot’s a bit matronly, but I’ve really liked their last few collections. I went into their store last week and saw the perfect pair of trousers. They’re lined, they have a side zipper, and the tweed is a warm brown. The fabric looks better in real life – it has brown, beige, and cream-colored yarns. It’s a herringbone weave, which I really like. I think my brown faux alligator oxfords (brogues, richelieus?) and my plum wool sweater will make this a good fall outfit, and I’ll wear one of my purple brooches to pull it all together. Not that I’m ready for fall – I’m hoping for a really nice, late Indian summer. My search for just-below-the-knee skirts has not been very fruitful. I typically buy my work clothes at chains like Ann Taylor or J. Crew but they don’t often sell skirts long enough to wear to work, and haven’t for a few years. I love boutiques and vintage stores, but not much luck there either. Dresses are likewise just too short. I’m about 5’8 with long legs and a short waist. I have no interest in dirndl skirts, elastic waist skirts, or tee shirt material skirts. I don’t mind skirts that reach my knees but really, 3 inches above the knee for work? I don’t want to look like a hoochie mama. Maxi skirts are fun for casual times but not for work. I have a professional job, and as much I like wearing pants, I also want to wear skirts that are attractive, well-made, and just below my knees. And not matronly. Is that so much to ask? Ann Taylor– Out of 37 skirts, there was only one casual maxi skirt. Banana Republic – Out of 34 skirts, there was only one casual maxi skirt. J. Crew – Out of 29 skirts, there were 2 formal long skirts. Pretty but not work attire. Anthropologie – Better odds here – out of 51 skirts, 11 are long maxi skirts; alas, they are not work appropriate. Talbots – Out of 29 skirts, 2 are below the knee and look work appropriate. That is, until I click on the navy blue one which is made of terry cloth! The other one, shown below, looks cute but it’s linen and I have to think about the work ironing linen entails. There were three other skirts that just graze the middle of the knee but I’d have to try them on to really see if they’re long enough. I used to think of Talbots as matronly but I found the cutest tweed skirt this winter there, and realize they’ve been improving their style. Really! So, out of about 180 skirts, only 4 or so are work appropriate for me? Listen up, retailers. You could make some serious cash if you paid attention to your customers. I don’t like shopping online, so don’t point me to your website with tall sizes. How about carrying a few of them in your brick and mortar stores?